Tivoli Gardens (often simply known as "Tivoli") is an amusement park and pleasure garden located in Copenhagen, Denmark. It is one of the oldest amusement parks in the world (actually the second oldest after Dyrehavsbakken), as well as one of Denmark's best-known tourist attractions. Additionally, there are many rides and attractions inside the park, aimed at both adults and children. These include 5 rollercoasters, including most famously a wooden rollercoaster (Rutschbanen), which is one of the oldest wooden rollercoasters still operating today. The park also contains the world's tallest carousel, The Star Flyer, which opened in 2006, and stands 262 feet (80 meters) high. 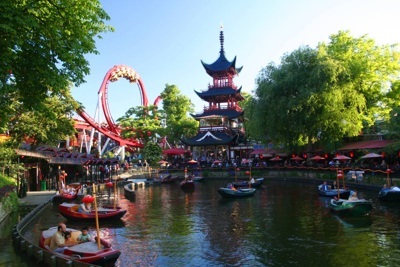 Situated on seventeen acres in the heart of Copenhagen, Denmark, Tivoli Gardens is one of the world’s most spectacular and popular amusement parks. Comprised of a lush public garden, theme park, food and shopping mecca, and performing arts center, Tivoli has captured the hearts and imaginations of people around the world—during the Christmas season alone, drawing one million visitors to their annual Christmas light shows and performances. The introduction by John Loring, who has designed for Tivoli since 1996, traces the development of Tivoli Gardens as an entertainment center and popular gathering place since it first opened in 1843, and highlights the myriad attractions visitors will find today. Illustrating all aspects of Tivoli are 200 stunning photographs of the park, its performers, and its visitors taken by world-renowned photographer Harry Benson over the course of four visits in every season. With its intimate, behind-the-scenes perspectives, Tivoli Gardens captures the magic and energy of this enchanting place throughout the year. Silver award winner for Best Garden Book of 2016 from The Independent Publishers Awards, A Tea Garden in Tivoli - American Garden Design Inspired by the Way of Tea is a guide to garden design and flower arranging woven around the story of a unique garden in the Hudson Valley of New York. "Great gardens in small spaces" is the theme. Gardens need not be Versailles-sized to be inspiring. This is an intriguing and accessible introduction to the Japanese garden aesthetic for the backyard gardener by veteran Zen and Tea student Bettina Mueller. Drawing from her three decades long study of the Japanese Tea tradition where great even legendary gardens are small by necessity, Bettina sets out to turn her 1/8 of an acre backyard in the small village of Tivoli, New York into a private world of beauty and tranquility. Awards for A Tea Garden in Tivoli: 2016 Silver medal winner for best garden book from Indpendent Publisher Book Awards. 2015 Best International Garden Design award from Gardenista.com.